Back in the day, my dad hated it when I would write or draw on my hands; in order to counteract my bad habit he'd threaten to get me a real tattoo. Of course, this scare tactic only worked until my dad suspected I would gladly take him up on his offer to get inked! The truth is, I've always had a soft spot for body art, but thanks to my dad, exercised restraint before ultimately deciding to get some permanent color. I've passed this wisdom onto my kids and now let them freely embellish their hands with all the temporary ink they want. 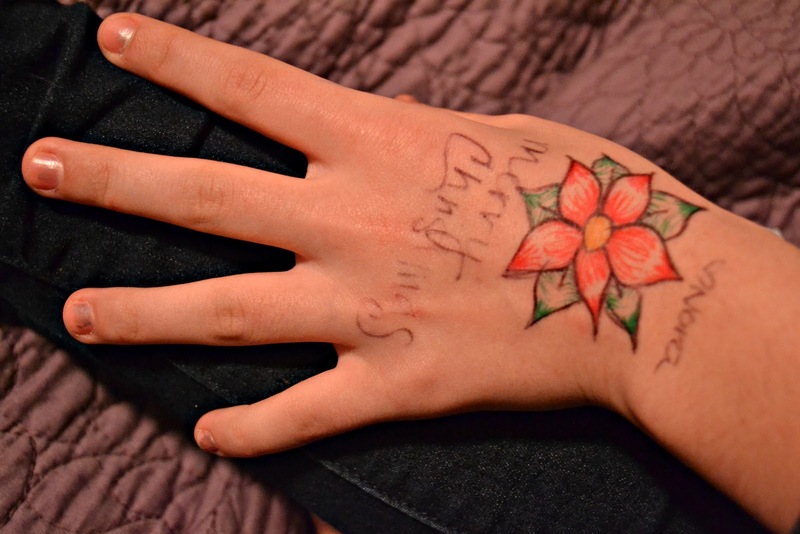 Yesterday, Emma came home with her hand adorned with a holiday poinsettia drawn by her friend. Just looking at it puts me in a holiday mindset!